My family has joined the ranks of birders who report to the Cornell Lab of Ornithology the birds that frequent our feeders. You can join or read more about birding by visiting their wonderful site. If you are new to bird watching, here is a great site that has tips for how to identify birds you don’t recognize. One of the benefits of bird watching is that it s one of the easiest ways to teach careful observation and identification by details. Kids train themselves to be patient, to look carefully and to make distinctions (does the wing on the chickadee have a pale white stripe or not? Black-capped or Carolina?). Additionally, keeping a log of all the birds you see, particularly what is called a “life list” where you note the very first time you see each species, is a great way to exercise those handwriting and listing skills. 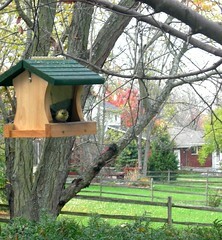 I’d love to see photos of your bird watching! Send them to me. We’ll post them here. This entry is filed under General, Nature Walks. You can follow any responses to this entry through the RSS 2.0 feed. Both comments and pings are currently closed.